Thuja occidentalis or eastern white cedar is a small-to-medium size evergreen gymnosperm or conifer tree with a geographic distribution in the northeastern United States and southeastern Canada. Its range extends from eastern Quebec and New Brunswick to Saskatchewan in the North and South to southern Minnesota, Wisconsin, Michigan and New York. It also occurs as small isolated populations in the extreme northern part of its range and as far south as Tennessee and North Carolina in the southern Appalachians. It is considered rare, threatened or endangered in several eastern states including Massachusetts, Connecticut, New Jersey and Tennessee. Thuja occidentalis is known under various colloquial names, arborvitae (tree of life), American arborvitae, eastern arborvitae, northern white cedar, eastern white cedar, thuier cedre, cedre-thuya occidental, cedre blanc, thuya du Canada, balai (Quebec), Tuja (Sweden), Amerikanischer Lebensbaum (Germany), ya bai shu (China). The name arborvitae was coined by Jacques Cartier a 16th century French explorer after observing Native Americans using the leaves to treat scurvy. This species is somewhat (or very) slow growing and typically reaches 40-50 feet tall with trunk diameters of up to 24 inches. Bigger trees have been known to exist with trunk diameters of 60 inches and heights reaching 80 feet. It has been documented that this tree can grow at least as old as 800 years, making it one of the longest-lived trees in the northeastern forests. One living specimen, believed to be around 1000 years old, somewhat stunted due to difficult growing conditions, has been identified in Leelanau County, Michigan. A dead specimen has been found to be at least 1576 years old, and is much older if we take into account that it appears to be missing about 323 annual rings from its base. In the northeastern forests, Thuja occidentalis can be found growing both in uplands and wetlands. In wet habitats growth is slower. It is often found growing in streambanks, lakeshores and swamps. In swamps, it is often associated with eastern white pine, yellow birch, eastern hemlock, silver maple, red maple, black ash, balsam fir and American elm. In the sphagnum bogs and fens, it is associated with black spruce, red maple and tamarack. Especially in the southern part of its range, occurrence of eastern white cedar is associated with limestone areas where the water is alkaline-to-neutral in pH and very rich in minerals. In the upland habitats, the tree occurs on well-drained limestone rocks and cliffs under growing conditions where the pH is slightly alkaline to neutral and tree competition and deer browsing are reduced. Under these conditions, tree trunks can often be seen with a rather smaller and often sinuous appearance. Farther North in Canada the tree is more ecologically wide-ranging, and is not only found over limestone and dolostone, but also over a variety of other rock types including granitic rocks. Thuja occidentalis is a dense evergreen tree, pyramidal or cone-like in shape and belongs to the Cupressaceae, the cypress or redwood family. This group consists of about 27-30 genera (17 are monotypic; having only one species) and 120-130 species worldwide. 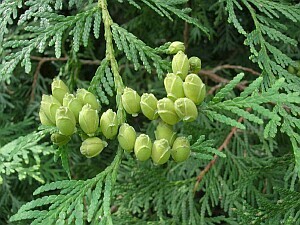 The genus Thuja has 5 species, 2 in North America (Thuja occidentalis and T. plicata) and 3 in East Asia. This species forms shallow roots with a vertical trunk that is mostly solitary but sometimes can be divided into 2-3 secondary stems. The stems can occasionally be twisted under difficult growing conditions. The bark is thin (6-9 mm thick), reddish brown or grayish brown in appearance, smooth on young trees, superficially furrowed and peeling with age as the tree gets older and with a somewhat diamond shaped patterning. The branches are usually perpendicular to the truck, with the branchlets yellowish green in color forming flat fan-like sheaths. The leaves are opposite, 4-5 mm long, flattened and scale-like, closely overlapping, with successive leaf pairs at right angles, the lower and upper leaves flat and lateral ones folded. The leaves are also fragrant and contain resin glands. Seed and pollen cone buds appear in autumn and mature during the following spring. The cones are small with the pollen and seed cones on separate branchlets. The seed cones arise from the tips of short terminal branchlets. The pollen cones arise from the base of the branchlets. The seed cones are 8-13 mm long and are borne on short stalks that are pale brown when ripe. Pollination occurs mainly by wind from late April to June. With fertilization, seed cones become fully mature by mid-August, ripen within 15-30 days and burst open 7-10 days after ripening. The seeds are double-winged, wind-dispersed and are ready to germinate the following spring after a few months of cold stratification. The dried cones persist for a long time on the branchlets after the seeds are shed. Seed production starts when the tree is around 6 years old, culminating with fairly high seed production by the age of 30 and with the highest seed production after the tree reaches 75 years of age. There seems to be especially high seed production every 2-5 years. Seeds find it difficult to germinate under high shade conditions. In addition to reproducing by seeds, this species also spreads by layering. Leaves of mature individuals are more shade tolerant than seedlings and favor layering under shade. The wood of Thuja occidentalis is fibrous, light brown in color, soft, light in weight, weak and fragrant. It is also resistant to temperature variations and moisture and ages and dries without shrinking. The wood is decay and mold resistant due to the presence of a compound called thujaplicin. This species is somewhat susceptible to fire due to its thin bark, high oil content, shallow roots and general flammability. It will quickly invade open areas resulting from burning, cutting or wind throw where it will often form dense, even-aged stands. On less fertile soils, it will form uneven stands. Under some circumstances, it is succeeded by more shade tolerant species. It is also believed that this tree also occurred in Europe but became extinct with the Pleistocene glaciation and may have been one of the first American tree species to be introduced to Europe in the colonial period. Winter foliage and shelter for deer. In some localities, the species is considered threatened due to overgrazing by a large deer population. Often used in hedges as an ornamental tree (120 known cultivars) or windbreak. Seeds, bark and leaves are likable to various birds and mammals as food source. Small birds use the leaves to hide from predators and to escape strong winds all year long especially during winter. 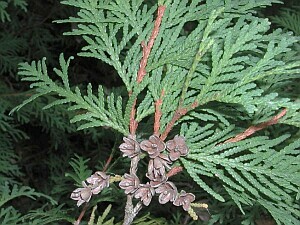 Cedar leaf oil is used in medicine and perfumes. Thujaplicin is sometimes used as a food preservative. High Vitamin C content in the leaves made it a favorable plant to use to treat scurvy by American Indians and the early European settlers. Used for heat and sound insulation in construction due to the presence of air spaces in the wood structure.